"PRIZE" at age 9 ~ still looking great! He was my dream dog. I so very much loved and enjoyed every minute I spent with him. 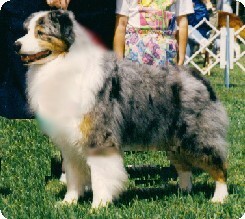 I purchased Prize at the 1984 National Specialty in Las Vegas, Nevada from Christine Doud of Showtime Aussies. Susan Rossy of Rossy's Aussies co owned Prize with me, but he lived with me and was my whole world for many many years. Prize was well known by Aussie enthusiasts. He won in 12 different states as well as an ASCA Pre-Show Best of Breed Award at the tender age of 15 months old. He always took at least an Award of Merit at every National Specialty he attended. This dog was so ahead of his time in the dog show world. He was an outcross, but my foundation dog nonetheless. I loved this dog and hopefully soon, there will be more "Prize packages" on the ground.